One of the things that I find so fascinating about combining my laptop and my knitting machine is how it’s such a cool convergence of circles. Hmmm, maybe a Venn Diagram is in order? 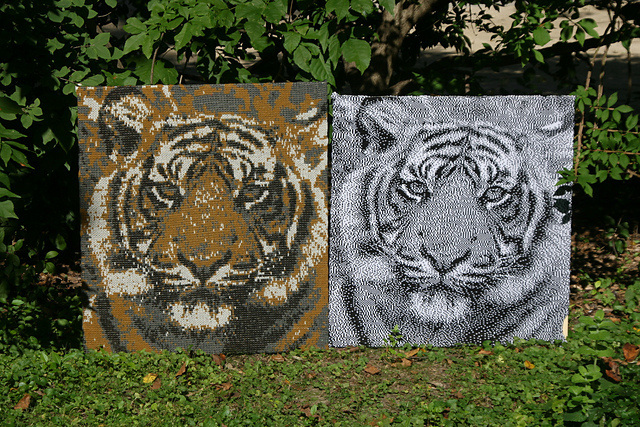 upon which I can then produce the most amazing knitted art. Now, if we start at the laptop, and back that story up, waaa-a-a-ay up, to very early computers, we will find (eh-hem, some of you might even remember) that they were programmed using punch cards. Gigantic, room-filling contraptions were fed hundreds upon hundreds of these cards with holes punched in them, in order to program the computer to complete certain tasks. Those punch cards had their origin in the weaving industry. Starting in the early 18th century, punch cards were used to control looms in order to automate the weaving of patterns into cloth. These punch cards would automate the selection of warp threads on the loom so that as the weaver ran the weft shuttle back and forth, a pattern developed in the cloth. This semi-automation allowed the creation of much more complex patterns than were practical to achieve using manual selecttion. Not only because of the time involved, but also because of the high likelyhood of errors being introduced into the cloth. Tasks that require rapid selection of multiple data without error are not well done by humans, but perfect for computers, of which the Jacquard Loom was a very early iteration. Now let’s move forward in time, but this time along the fiber arts route instead of the computer route. The very first knitting machines were introduced in the late 16th century. There wasn’t rapid development for some time. 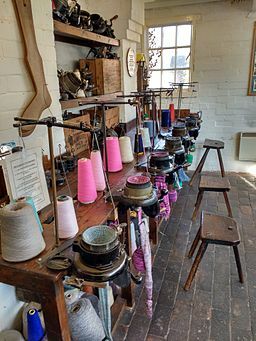 The first widespread introduction and use of knitting machines domestically was at the beginning of the 20th century, when circular sock knitting machines were widely used in the home to knit socks for soldiers. By the 1940s and 1950s, flat bed knitting machines were being produced for the consumer market. These had little or no patterning ability, other than what could be achieved manually, like the earliest looms. 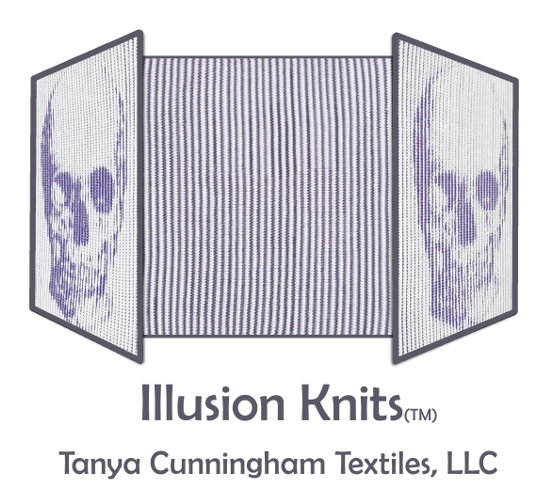 Eventually, automatic patterning was developed for the domestic knitting machine, using – guess what?? – punch cards! Knitting machines manufactured in the 1970s and 1980s were capable of reading a punch card that would select needles automatically as the knitter moved the carriage (equivalent of the loom’s shuttle, it carries the yarns) back and forth. 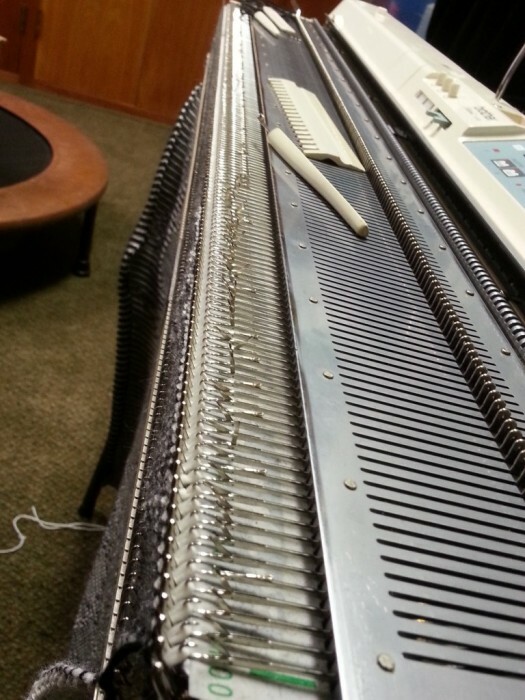 The punch card system allowed for a 24 stitch repeat, along the needle bed of 200 needles. A definite advance for the time, but only a whisper of the capability that we now have to use a laptop to automate the selection and patterning for every one of the 200 needles independently, for every row of knitting. So here we are, back in the 21st century, and computer programing has met up with cloth production to move forward in a whole different direction. I’m pretty psyched about it! Cool historical journey!! Fascinating stuff. Thanks, Polly. I feel like I’m embarking on a wild journey! Thanks for checking in, Leslie. I appreciate your kind comment. What a fascinating and informative back story to your work.